Access Novartis's corporate rap sheet compiled and written by Good Jobs First here. In August 2011, Novartis representative Don Stetcher was given the American Legislative Exchange Council's (ALEC's) 2011 Private Sector Member of the Year Award. Novartis contract tests out to Huntingdon Life Sciences (HLS). HLS is the 3rd largest contract research organization (CRO) in the world and the largest animal testing facility in all of Europe. Firms hire CROs to conduct animal toxicity tests for agrochemicals, petrochemicals, household products, pharmaceutical drugs and toxins. HLS has a long history of gross animal welfare violations. See also Huntingdon Life Sciences. Novartis contract tests out to Covance Laboratories. Covance has a long history of gross animal welfare violations. See also Covance Laboratories. In April 2003, the largest ever set of data concerning animal experiments in the United Kingdom was released following a defeat earlier in the month for a 30 month injunction by Novartis and its former British subsidiary, Imutran. The documents revealed primates being used in the search for solutions to the chronic global shortage of human transplant organs. Baboons were transported from the African savannahs to die in steel cages the size of toilet cubicles. According to the documents, a quarter of the primates died from "technical failures". Researchers describe monkeys and baboons dying in fits of vomiting and diarrhea. Other symptoms were violent spasms, bloody discharges, grinding teeth and uncontrollable, manic eye movements. Animals retreated within themselves, lying still in their cages until they were put of their misery. Baboon W201m died of a stroke after two days of suffering from limb spasms and paralysis. Baboon W205m was "sacrificed" after 21 days. A genetically modified pig's heart had been attached to the vital arteries within its neck. Researchers noted the heart was swelling way beyond its natural size with a strange yellow fluid seeping from the organ. The 150 page Diaries of Despair report based on the documentation, provides the public with an unprecedented and extensive insight into the reality of vivisection in Britain. Never before has so much secret information about animal experiments entered the public domain. The report was effectively banned for almost two and a half years by an injunction by Imutran and Novartis in late September of 2000. The leaked documentation reveals horrific animal suffering, corrects misleading public presentation of research and exposes government deception. The five part report provides background information on xenotransplantation (transplanting organs of one species into another); an overview of the leaked documents and the rationale behind transgenic pigs as a potential source of xenografts. It describe the suffering of primates used in the research and the legal framework regulating animal testing. The report documents baboons and cynomolgus monkeys, from (in the case of the baboons) capture in the wild, through transportation half way across the world and their deaths in experiments conducted at HLS. Organ transplants are transplants are prohibitively expensive and of limited value. However, selling transgenic pig parts and other organs is very profitable. Novartis and its subsidiaries have killed thousands of animals and spent millions of dollars attempting to develop animal organs for transplantation into humans. Xenotransplantation experiments have a long history of human and animal costs. They have proved to be one of the greatest medical disasters of all time, for both animals and recipients. Approximately 6,000 people are on waiting lists for human organs, an organ shortage which could largely be solved through default consent to organ donation after death. See also Humane Movement, section 5. In spite of 100 years of failed research, the quest to turn animals into spare parts warehouses continues and has done nothing to slow Novartis' search for an immunopig; (pigs genetically manipulated to carry human genes.) However, failed research has shown that animals transplanted with human genes do not have suitable spare parts for humans, any more than non-genetically altered animals do. Other species such as hamsters, rabbits and monkeys have also been subjected to failed horrific and pointless xenotransplantation. The surgeries are so monumentally unsuccessful that animals usually begin to die within minutes. The transplanted organs do not function or are rejected almost instantaneously. In one experiment, a pig's kidney was accidentally transplanted into the abdomen of a monkey. The victims are then overdosed with anesthetics and their spleens were removed. Monkeys and baboons who survive xenotransplanation die of organ rejection, organ failure and infections from drug toxicity and impaired immune systems. Novartis has subjected monkeys to lethal infections, lethal blood clotting, bleeding complications, viral and protozoal infections, lymph cancer, severe nausea, severe stomach inflammation and diarrhea, dehydration, fatal pneumonia, persistent wound infections, breakdowns, brain trauma, heart attacks, pneumonia and anemia. Primates are also given massive doses of immune-suppressing drugs which cause internal hemorrhaging. In one experiment, a swab was left in a monkey's abdomen which in turn caused a lethal infection. Such incidents occur on a regular basis. In experiments in Basel, Switzerland, rats Rats between 4 and 8 days age are deprived of oxygen. Some are exposed to reduced oxygen content. Some of them are killed on the 11th day of oxygen deprivation and their brains cut out and examined. Others are exposed to noise and rattled in steel cages until they begin to show symptoms of schizophrenia. Finally, on their 120th day the rats are killed. Novartis has been plagued by a number of recent drug safety issues, including the delay of its diabetes drug Galvus and "evaluating" the launch of a generic version of its Lotrel blood pressure treatment. Novartis withdrew the bowel drug Zelnorm from US shelves in March of 2007. In August of 2007, Australia banned Novartis' Prexige, after the deaths of two patients. According to Australia's Therapeutic Goods Administration (TGA), it received 8 reports of serious liver damage, including two deaths and two liver transplants linked to the COX-2 painkiller. In December of 2007, hundreds of activists broke into Novartis' subsidiary Syngenta's agrochemical plant in Sao Paulo, Brazil. According to a company spokesperson, 50 employees were expelled and production was shut down. Members of the Landless Rural Workers’ Movement (MST) and its allied group Via Campesina, destroyed genetically-modified corn and soy seedlings at a Syngenta farm in the northeastern state of Ceara. The groups accused Syngenta of attacking landless workers and violating environmental laws and demanded that Syngenta leave Brazil. In October of 2007, an activist was shot and killed during a protest at a Syngenta farm in the southern Parana state. According to the MST, the farm illegally produced genetically modified crops (GMO)'s within a protected enviromental zone close to the internationally acclaimed Iguacu water falls. The Paraná State Federal Justice decided that experiments with GMOs in the surroundings of the Iguaçú National Park are illegal. According to Judge Vanessa Hoffman, the park has a a 10 km buffer zone and the company was fined R$ 1 million by Brazilian environmental authorities. 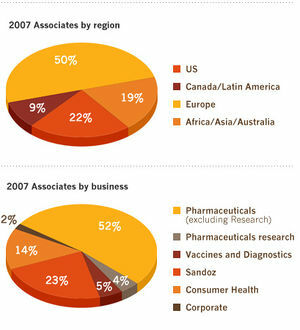 After the merger, Novartis reorganized its activities. The company spun out its chemicals activities as Ciba Specialty Chemicals, which became an independent company in January of 1997. In 2003, Novartis created a new company named Sandoz, a subsidiary that bundles its generic drug production by reusing the predecessor brand. ↑ "Novartis History", Novartis, accessed December 2008. ↑ "BASF makes offer to acquire Ciba", Media Release, September 15, 2008. ↑ "BASF buys Swiss specialty chemicals maker Ciba", International Herald Tribune, September 15, 2008. This page was last edited on 17 July 2017, at 19:57.